It's been one of the craziest 48 hours of our nation's history. The 14th General Election is done and Tun Mahathir has been elected the 7th Prime Minister of Malaysia. Before we get to the real hard work of rebuilding, I decided to write down some thoughts - so I can look back someday and remember this day. The final question in Astro Awani's coverage last night was "What does this mean to you?" This is what it means to me. Fear is the strongest of human emotions. Political parties know how to use it to gain power. And it usually works. For too long, we've been peddled and shackled by fear -- fear of the unknown; fear of people who don't look like us; fear of punishment. But this time, the people had had enough. Fear is destructive, it only tears down. Instead, the people chose hope. And the hopes of a nation eventually conquered its fears. Fear can paralyse us temporarily. But hope always wins in the end. Now, it's finally worth it. Thanks to you brave ones, even the chiller ones like me have been inspired to be part of the change. I've always felt that one of our biggest problems as Malaysians is apathy: we don't care enough to take action. So today, thank you for never giving up. Someday, I hope we can all be brave like you. "Stock up on food and water." "Stay at home, in case of any emergencies." We've all heard these pieces of advice before from our wise elders. Lessons learned from difficult times in the past. But things are different now. After decades of fears and threats of racial riots, the most beautiful thing happened -- a peaceful transition of power. Malaysians are tired of idiots playing up religious and racial issues. We're a peaceful people. And now we're growing up. I knew this when my 60-70-something-year-old parents suggested we go out for dinner last night. And apart from a lot of happy-looking people, it felt just like any other normal night in Alor Setar. As we were having cake to celebrate, I asked the young Malay server: "Bang, boleh tolong ambik gambaq tak?" Do we have more freedom of speech now? It certainly feels that way. Some say the turning point was on the long night of 9th May, when a panellist on TV started openly questioning the SPR. Perhaps sensing the winds of change, other panellists started discussing the mistakes of the BN government, and why people were so angry at them. I'm just a writer who writes for fun, so maybe I'm way out of my depth here. But I believe now is the time for the fourth estate to rise. For the writers, journalists, reporters (and maybe even influencers?) to shake off bonds of the past. To report openly and truthfully -- without fear or favour. "Democracy dies in darkness" goes the slogan of one of my favorite newspapers. And as much as I hope the media will always be a shining light, there's so much more I wish for democracy. We've just elected parts of the new government. They'll make new laws (legislative) and run the country (executive). But who keeps them in check? There's a third branch of the government called the judiciary -- the courts. But some say that they aren't really independent anymore. Some say that most of our institutions actually have no more power, and it's all gone to just one person. But let's not forget: "Power corrupts. Absolute power corrupts absolutely." The first time is always the hardest. I've wanted this change in government for 10 years now, but after 2013, disappointment taught me not to have expectations. I voted, but I never thought we'd be able to pull it off. Forgive me for my weak faith: "They have too much money." "They're too strong." "They have too many dirty tricks." But now that we've seen it with our own eyes - we know that it can be done. We know that any future government that oppresses the people can be voted out. We know that democracy works. We are the masters of our own destinies. We've proven it. If anyone ever tells you that you're powerless to do anything, remind them that on the 9th of May 2018 -- you were there, part of a movement that amazed the world. You were there, when a 92-year old man came back after 15 years, to defeat the very party he once led and loved, to atone for his mistakes. You were there, when a young nation went to sleep and awoke a great symbol of democracy. You were there, when we all joined hands and pulled off the greatest comeback of all time. I was there too. And now I believe again. 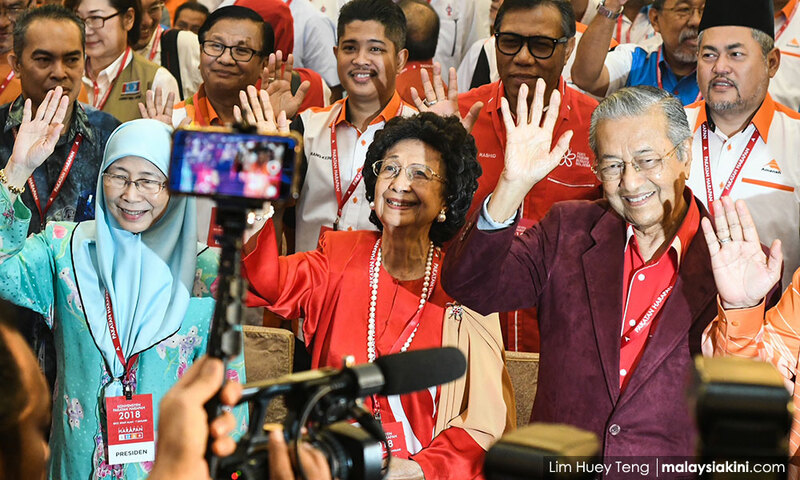 PM Tun Dr Mahathir made the announcement in a press con today. She has been active in politics for nearly 20 years.